Dead bolt installation must be completed with great precision and you can be sure that the experts of our FC Locksmith in Toronto have high knowledge and experience. We install all types of dead bolts in Toronto made of any brand and we show a great zeal during installation because we are aware of their importance to your security. 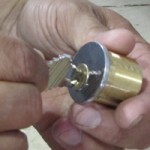 Deadbolt installation is our specialty and we ensure high quality service. Dead bolts can secure your door on their own or in combination with other locks. They are either of single or double cylinder with the former needing the use of a key only on one side and having a twist knob on the other while the double cylinder bolts require the use of a key on both sides. Some knobs would also lock and, hence, a key would be needed as well. There are various styles of deadlocks and all of them are practical and have the ability to secure the door properly. Our Toronto locksmith company is an expert in all dead bolts including double cylinder dead bolts, which are often prohibited due to safety reasons. 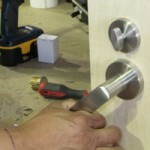 Our FC Locksmith Toronto technicians have a tremendous experience with dead bolts. We can supply you with all types of deadlocks and promise to install them with accuracy. Although they are very experienced our repairmen are still very thorough with every little detail concerning deadbolt installation. We provide products of the best brands, use the best equipment in Ontario, pay attention to the quality of the strike plate and the length of the screws and promise quality job.